Irish Rock Band & Harlem Gospel Choir: A Match Made in Heaven? EDITOR’S NOTE: Jesus & Dawkins welcomes guest posts. Today’s entry comes from Eddie Quiñones, a fellow Yale grad who enjoys rock music, New York sports, and theological dialogue. Some ideas sound great in theory but never work out, like New Coke and the McDLT. Occasionally, we come across the opposite: a laughable concept that somehow succeeds in practice. Wikipedia, an open-source encyclopedia, is a prime example, as is the survival and spread of early Christianity. Today I’d like to highlight an example of the latter. Imagine you’re a musician trying to hit it big. Do you think you’d maximize your chances for success by writing a gospel song, fusing Christian lyrics with rock instrumentation? Probably not. It sounds like an awesomely bad idea that Quincy Jones would not approve of. U2, however, decided to try anyway. “I Still Haven’t Found What I’m Looking For,” from their 1987 album The Joshua Tree, was a massive success. It ruled the airwaves, solidified their status among the biggest stars in the world, and remains one of only two singles in their 30+ year career to hit #1 on the US Billboard charts. In other words, you might have heard of it. What you may NOT have heard is a special version of the song with a Harlem choir, The New Voices of Freedom. The choir, featuring both professional singers and high school students, covered the song using a traditional choral arrangement. U2 loved their interpretation so much that they invited the New Voices to sing onstage when they toured in New York City. Their rehearsal, captured in an iconic scene from the 1988 documentary film Rattle And Hum, is in my opinion the greatest version of the song ever performed. As U2’s four white Irish dudes stroll into a Baptist church on West 124th Street to meet the choir, the dated ’80s trends are palpable. Loud sweaters and big hair abound. Drummer Larry Mullen rocks a sleeveless Harley t-shirt tucked into jeans. Choir director Dennis Bell looks like Don Johnson in Miami Vice, with flowing locks of hair, suit sleeves rolled up, and sunglasses worn indoors. At the 4-minute mark, you can spot an Allen Iverson lookalike sporting a beret and a leather Porsche jacket. The choir’s voices, kicking in at the 2-minute mark, fill the room and intensify the performance, as minimal instrumentation is used. The Edge is the only musician playing his usual instrument, with his echoing, almost bagpipe-esque guitar line providing the foundation. Larry borrows a conga drum to keep the beat, and bassist Adam Clayton cheerfully claps along in the pews like one of the congregation. Bono, normally the center of attention, steps back and signals for the choir to ad-lib through the final section of the song. Why does such an unusual collaboration work so powerfully? I believe their rapport stems from a shared feeling of vulnerability. U2 made themselves vulnerable to commercial failure and mass ridicule by defying the traditional hit formula. Instead of playing it safe, they broadcasted their spiritual yearning while on the verge of stardom. As a community, Harlem’s inhabitants experienced tremendous vulnerability throughout the 1980s. The longtime hotbed of cultural inspiration was struggling with high rates of unemployment and crime, as well as a crack epidemic that devastated its population. Although the band and choir came from very different contexts, perhaps their synergy made sense, considering their respective states of vulnerability and longing for transcendence. This unlikely combo delivered a moving performance, one that you can appreciate whether you’re a believer, a Belieber, or neither. Please do yourself a favor and check it out. Eddie, thanks for sharing this video and your thoughts on it! I really like your insight about vulnerability. 1) I love the pop culture references. 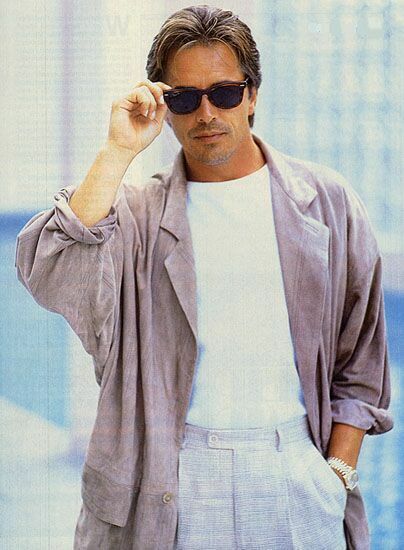 Any post that mentions Don Johnson’s Miami Vice character is a winner in my book.